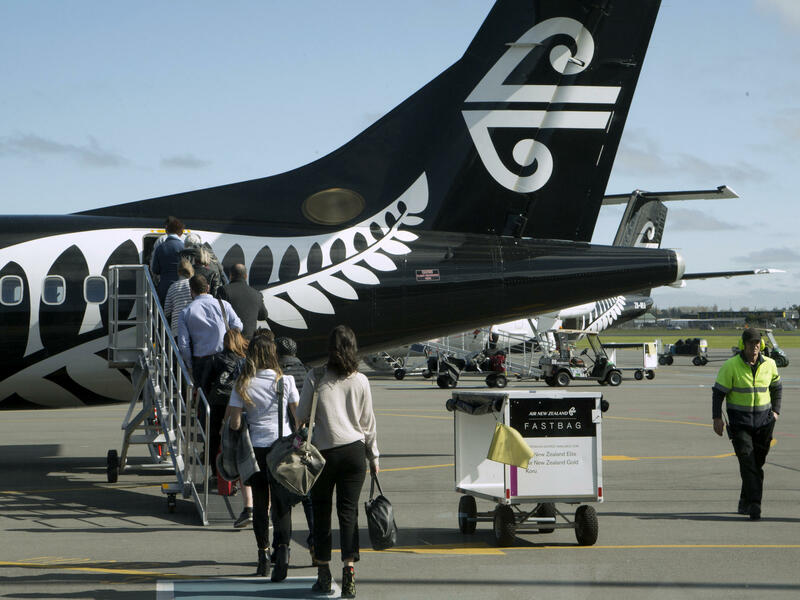 Passengers board an Air New Zealand flight at Christchurch Airport in New Zealand in 2017. A new law says arriving travelers may be fined for failing to provide a passcode or fingerprint to unlock electronic devices for customs agents. "The traveling public is unlikely to notice much difference at the border," the government said in a press release. Maybe. But a spokesperson for the New Zealand Customs Office acknowledged that this policy ventures into new terrain. "We're not aware of any other country that has legislated for the potential of a penalty to be applied if people do not divulge their passwords," Terry Brown, a customs spokesperson, told The New York Times. Customs now has the ability to search any device that an officer "has reasonable cause to suspect." Brown said that the agents will search the phone in flight mode and not include data stored in the cloud. But if travelers don't provide a passcode, agents have the authority to seize the device. Thomas Beagle, chairperson with the New South Wales Council for Civil Liberties, called the new policy a "grave invasion of privacy of both the person who owns the device and the people they have communicated with." "Modern smartphones contain a large amount of highly sensitive private information including emails, letters, medical records, personal photos, and very personal photos," Beagle said in a statement. And he said the plan for agents to search the device but not the cloud doesn't make a lot of sense, securitywise. "Any professional criminal could easily store their data on the internet, travel with a wiped phone, and restore it once they enter the country," he wrote. "Any criminal who fails to do this would surely pay $5k fine rather than reveal evidence relating to crimes that might involve jail time." The law applies to both New Zealanders and foreign travelers. Last year, agents at New Zealand's airports searched 540 devices, and the agency expects that number to stay about the same, according to Radio New Zealand. On Twitter, a New Zealander named Dylan Reeve noted that the global scrutiny of the new policy could have an ill effect on his country's economy: "Complain about a $35 dollar 'tourist tax' all you want, coverage like this in international media will do far more damage to our tourism industry!" In 2016, U.S. customs agents searched approximately 23,877 devices — a big spike from 2015, when about 8,500 were searched. Border agents in the U.S. have been known to confiscate devices from travelers, prompting a lawsuit by the American Civil Liberties Union and the Electronic Frontier Foundation. In May, a federal judge ruled that the case can proceed. And as NPR's Brian Naylor has reported, the U.S. rules about such searches aren't totally clear: "The ACLU says Americans can refuse to give CBP agents their passwords, but at the risk of being detained and having their devices taken from them. Foreign travelers can be denied access to the country if they refuse to comply."